THE TEERITZ AGENDA: Friday 18/12/2015 - So Long, You Mad Men, You & This Week's Wristwatch. 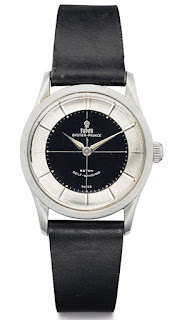 Friday 18/12/2015 - So Long, You Mad Men, You & This Week's Wristwatch. I still had the AquaTerra on my wrist. Can't remember the last time I wore the same watch for more than a few days. And here's Don Draper's wristwatch. Or rather, one of them. 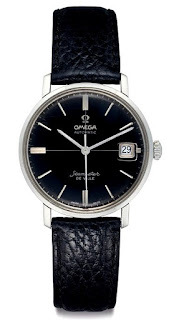 Over the course of the TV show, he wore a Jaeger- Le Coultre Reverso and a Rolex Explorer as well, but it would seem that this Omega Seamaster De Ville has caused the greatest frenzy among watch collectors and fans of the show. Perhaps due to the fact that it got a few nice close-ups in a couple of episodes, thus allowing wristwatch nerds like myself to identify it. 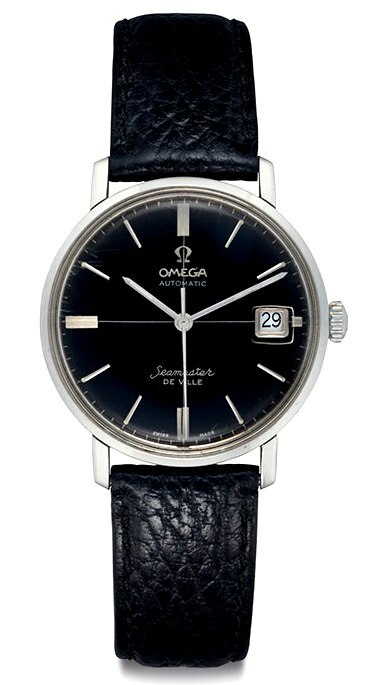 This Seamaster De Ville is a circa 1960 model, Reference Number 166.020. It was provided by Derek Dier, well-known supplier of timepieces for film and television. This here on the left is a Reference 7967, dating back to 1959, and it's in very, very nice condition. Similar dial configuration to the classic Universal Geneve Polerouter models of the early to mid 1950s, this Tudor is a pretty rare watch. I'll admit that I haven't seen these two-tone dial models very often during my travels throughout various pre-owned watch sites over the last fifteen or so years. Which is why, given the choice, I would have snapped this piece up instead of the Omega. Either way, though, both are nice wristwatches. I'm a little rusty with regard to the size of these two watches, but I'd be fairly confident that they both measure around 35mm in diameter. Which, to me, is a classic size for this style of wristwatch. I'm glad that there are still a few brands out there that offer watches in this size. This Tudor also had an estimate of between $1000 to $2000 USD and it reached a final price of $10,000. Some folks have got a lot of play-money to mess with. So anyway, that's my week. I've been very busy with other things, which is why these Friday posts have been short or non-existent and I think things will stay this way for some time. As much as I like writing these posts, life is throwing things my way and there are also a few other matters I'd like to deal with as we continue to settle in to this new home of ours. My wife and I have both admitted that we don't miss our old house at all. Ain't that funny? Part of me thinks I should feel a little guilty, considering that we raised two kids in that house for fifteen years. However, I then begin to think about all the cars that would tear down the dusty dirt road out front, sending a cloud right across our front porch. I think about the young punks who lived nearby and would break branches off the trees across the road because they were too stupid to think up something more worthwhile or exciting to do. They were around sixteen years old, so they'll be getting driver's licences in the next year or two so that they can become the new generation of hoons who tear along the dirt track outside our old house. So yeah, I don't feel guilty about not missing that old house. It served us well, to be sure, but we outgrew it a long time ago. Meanwhile, I'm working on one of the bookshelves for the study. This shelf, and three more like it, will measure 2.4 metres in height and just under one metre wide. Hopefully, they'll hold all of our books by the time they're assembled, varnished and positioned. Aside from that, I'm waiting to hear back about a job. More about that once I know for certain. Don't wanna jinx it. Speaking of jinxes, I watched a fascinating six-part HBO documentary called The Jinx: The Life And Deaths of Robert Durst, directed by Andrew Jarecki earlier this year. It tells of a man named Robert Durst who comes from a wealthy family that runs a large real estate firm in New York. Durst has long been suspected of being involved in the disappearance of his wife Cathy back in 1981, but her body has never been found. He was arrested in 2001 following the murder and dismemberment of a neighbour, but was subsequently acquitted of this crime, but came under investigation again following the murder of a longtime friend of his. There's a lot more to the story and it's a well put-together documentary which touches on police investigation procedures, the American legal system, and the power (and sense of entitlement) of the wealthy. Well worth catching this doco. We're heading for a top temperature tomorrow of 42deg (107.6F!). I might try frying some eggs on the roof. I can recall these kinds of temperatures back when I was a kid in the 1970s, but that was a fairly dry type of heat. Nowadays, we get quite a bit of humidity in the air which feels like I'm breathing air in in blocks. There's a real muggyness in the air now that never existed when I was younger. I respect whatever views you may have on the subject, but I personally believe that Global Warming is a real threat. I'll leave it at that. This blog o' mine is no place for science or politics. Okay, my glass is empty (how'd that happen? ), so I think I'll go guzzle a few litres of water. Have a great weekend, all! Oh, and if I don't get a chance to say it next week, have yourselves a very safe and happy festive season, whatever you celebrate. 'Cos we're all people, after all. I always enjoy your Friday updates. And I love the Madmen-themed letterhead. Thank you also for the typecast; I know it takes a bit more effort, but really adds to the overall quality. Thanks, Joe. The typecasts require a little more effort, and they can't be edited with the same ease as when written on the PC, but a typewritten page makes a very pleasant change from all of the computer font that well read all day long. And, I like the way you tend to add a postscript at the end of your typecasts. I've done the same on occasion because I suddenly remembered something that I didn't include in the original typecast. I might have to make a habit of it.